Had time to work on a card yesterday as it was raining here and my hubby was working. Funny what you can do when you have the house to your self. My graphic is a wonderful Spring type lady, that I don’t remember who posted it. I printed it onto acetate then ran it through the Xtron. White embossed the Hero Arts script on the corner, trimmed to size and added it to a scrap of designer paper. The cream panel was stamped with a small TAC stamp in pumice stone distress ink. Then punched and trimmed to size. The Blue background paper is another scrap which I stamped with two stamps. In broken china is a free stamp from convention (name ?) and the white embossing is Hero Arts stamp. The small tag (Missing You) is from Stampin’ up. Enjoy this Wonderful Memorial Day. An elegant and sophisticated card. So beautiful and I love all the details. This is gorgeous! I love the effect of the image printed on transparency, and the white script over top. Beautiful in every detail! Where to begin, the whole thing is a beauty. To nice to be just a card. This is so beautiful.... that embossed script is a fantastic element and I love all the other details as well. Very lovely and love the colors! 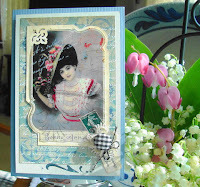 What a beautiful and elegant card Vada! 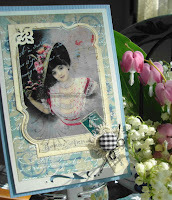 Gorgeous card - love the frame around the image. I'm amazed how beautiful that image turned out on the acetate! Gorgeous artwork Ms. V!